Have you decided that your pet needs a kennel or that his old one is getting too rickety? Outdoor kennels come in a variety of styles and sizes and can be portable or permanent. To decide which is the best outdoor dog kennel for your pet we have searched the market to track down many of the best options available today. Why Consider an Outdoor Dog Kennel? How to Choose the Right Dog Kennel for your Pet? There are a few different types of outdoor dog kennels out there. Jump straight to our buying guide to help you determine exactly what you should be looking for in a kennel as you shop or read the reviews for the best outdoor pet kennels below. This 4-foot-high pet kennel is made from durable steel and has one door that is easy for owners to get open. Set-up takes just minutes and this kennel is made for both indoor and outdoor use. For additional space, more than one of these Aleko kennels can be put together. This kennel is an affordable option and owners report to like it because some larger dogs who can escape from or break other kennels have not been able to get out of this one. On the other hand, some dogs do manage to break apart parts of the frame. This is a roomy kennel that is easy to clean and is made to resist all weather conditions. Owners enjoy how sturdy this kennel is and the fact that it doesn’t rust, but it does not come with a top cover. Luckily Aleko also sells a top cover suitable for this model to complete this outdoor dog kennel and protect sensitive dogs from excess sun and keep them dry in snow or rain. If you're looking for the best outdoor dog pen you won't go wrong with the incredibly sturdy and secure Aleko Heavy Duty Dog Kennel. Advantek offers dogs a unique octagonal design pet gazebo with a secure access window and a sloped roof to provide safety from the elements. The cover is made of waterproof reversible polyurethane. One side is dark and one side is light to either absorb or reflect heat. This dog kennel is easy to set up, requiring no tools and is great for dogs who weigh 100 pounds or less. 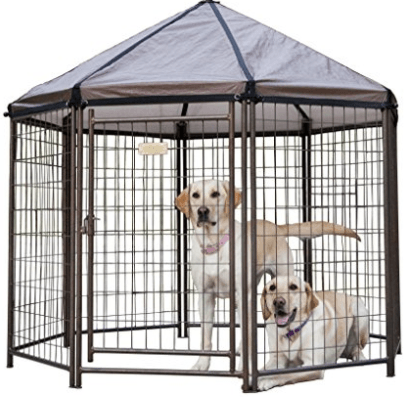 Like the other dog kennels reviewed here, the Advantek Pet Gazebo comes in three sizes. Small is 4'ft. X 4'ft X 4'ft , Medium is 5 ft. x 5 ft. x 5 ft and Large is 8' ft. X 8' ft. X 8'ft. all in an octagonal shape design. 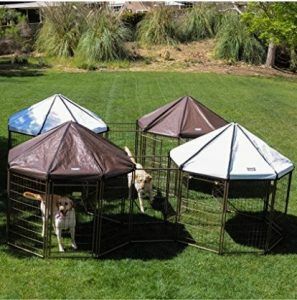 If you want your dog to have more space, you can connect more than one of these gazebos together without having to buy any extra parts to do so. Owners love this product because it works and gives their dogs a lot of room to play and relax. 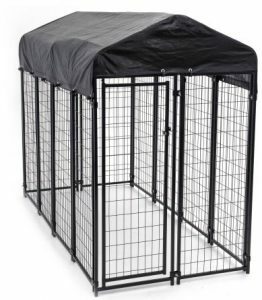 Many owners who travel or go to dog shows enjoy using this kennel because it is easier than others to move, although it can take a little longer to set up and take down. If you're looking for the best modular outdoor dog kennel that is reasonably priced, then try out the incredibly stylish yet functional Advantek Dog Kennel. It is ideal for use in a basement, in the backyard, on a patio or deck. 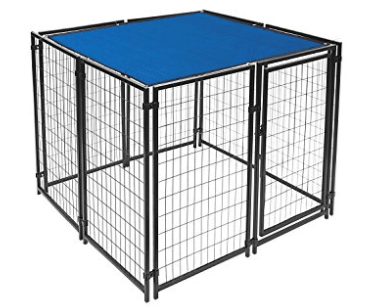 The panels of this welded wire kennel come preassembled for easy set-up and use, weighing a total of 81 pounds. The 11 panels are secured by 24 panel clamps (included) and features an additional gate panel with lockable steel gate latch. This Lucky Dog Uptown Kennel focuses on providing a safe, durable space to keep your dog happy while you are busy or away, and they pride themselves on working towards more environmentally friendly practices too. Available in three sizes this dog kennel is ideal for larger breeds, or multiple pets. Sizes are: 6'H x 4'W x 4'L, 6'H x 4'W x 8'L and 4'6"H x 4'W x 4'W. The Lucky Dog Kennel is made with durable welded steel that is rust and corrosion proof as well as free from sharp edges that can harm your dog. This kennel includes a waterproof sloped cover that can protect dogs from sun, rain, snow, and other weather. We also love the fact that his makes for a great cattery too! The cover is UV protected so owners don’t have to worry about it being easily worn down and it secures to the kennel with durable elastic cords. The raised legs conveniently make this kennel easy to clean and help keep the floor warm and dry for your dog during cold and wet weather conditions. The fact that it is easy to clean also helps to avoid bacteria build-up. Owners love that this kennel is quick to set up and requires no tools to put together. 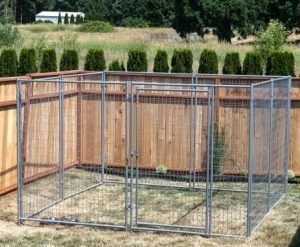 If you are looking for the best large outdoor dog kennel, you can't go wrong with the Lucky Dog Uptown Welded Wire Dog Kennel. Overall height of this kennel is 6 foot high in the center only. The PetSafe Boxed Kennel is 5’L x 5’W x 4’H with a durable rust resistant finish. 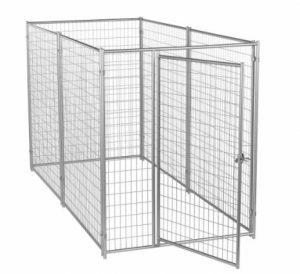 This superior dog kennel comes with a top panel which is great for dogs who like to try to jump out of their enclosures, and has a gate that can be set up to open either way depending on what is convenient for you. The sunblock top is perfect for owners who plan to leave their dogs outside in their kennel for extended periods of time, because helps keep them safe from rain, snow, or excessive sunlight. Compact size is ideal for decks, patios, yards and garages. This kennel sets up in under an hour and owners can purchase extra panels to expand it and give their dogs more room to run around and play. Owners love this durable kennel that is easy to move around and reconfigure for any space, although some large dogs may be able to pull at the wire and break it. 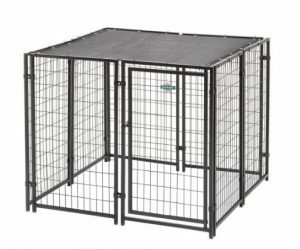 If you're looking for the best chain link dog kennel that can be used all-year round and easily expands as your furry family grows then PetSafe Cottageview Dog Kennel is your top choice. The Lucky Dog outdoor kennel comes in several different sizes depending on your breed size and weighs 135 pounds. Idea for medium to large-sized dogs. There is a one-year manufacturer’s warranty against defects on this kennel, which is easy to set up and gives dogs a lot of room to play and run around. Some satisfied customers have shared that this kennel was great for dogs who love to escape from similar pens and kennels. However, a couple of customers have complained about missing or not working parts and difficulty reaching the company for replacements. 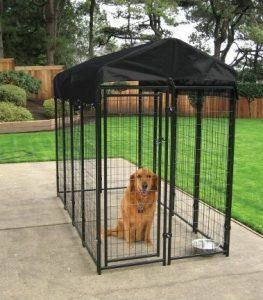 Overall reviews for this kennel have been positive and while they recommend that owners anchor it to the ground, there are no tools required for set-up. 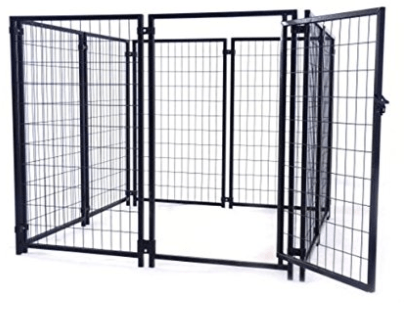 The steel frame is very durable and made with dogs’ safety in mind. Owners love this kennel because it is easy to clean and is easy to set up in any shape that works for your space. If you're looking for the best outdoor dog run so your pets can run freely and play happily the Lucky Dog Modular Welded Wire Kennel is your top choice. The list is endless, but here are a few reasons why you should seriously invest in an outdoor pet kennel. Outdoor dog kennels are a great solution for owners who are away at work during the day but don’t want to keep their dogs cooped up indoors. Or owners who have don't have a fenced backyard. These dog kennels also make great spaces where larger dogs and working dogs can spend time in the sun and fresh air when their owners are not able to supervise them too closely. Rather than let your dog get bored inside, you can let them out to hang out in their dog kennel while you’re cleaning or running errands. The best part in these kennels are taller than dog playpens so dogs can’t jump out or escape. Keeping a dog outside in a kennel with toys can help them stay content and preoccupied, rather than risk them getting destructive and making messes or damaging your home while you are away. As much as we would like to let our dogs loose, it doesn’t always work out that way and crates aren’t exactly the best solution either since they can be a little cramped after longer periods of time. A few things that owners need to keep in mind when it comes to these kennels is that they should be built on a flat part of your property where rain won’t build up. The kennel should be out of direct sunlight and sheltered with a sloped roof (permanent or removable) in case of rain. Dogs should have clean water available to them while they are in the kennel. Another thing is that owners should not use a kennel to replace walks and other exercise. This is especially important for large, high energy dogs but all dogs need exercise to be happy and healthy. Outdoor dog kennels come in different types, sizes, and materials, so it’s important for owners to explore their different options and choose the best one for their unique dog, climate, and overall situation. Choosing a dog kennel with your intended purpose in mind can help you make sure you find the right fit for your needs and your dog’s needs. 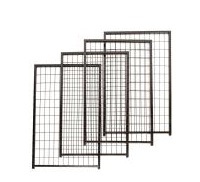 Welded wire metal with panels. Molded plastic (Plastic is strong, easy to clean and waterproof, but not indestructible). ​Now that you know the types of dog kennels, it's time to decide how exactly you will be choosing yours. You will hardly go wrong as these things aren't difficult, it just takes a little time researching. Nevertheless, selecting the right kennel will make your life and your dog's life easier now and down the road. Things you have to consider are: the size, materials used, height, weight, covers, will you need stakes and much much more. So let's take a glance at the why's and how's behind why you may indeed want or may not want some of these key features. This is a big one, when buying an outdoor dog kennel, you should take into consideration your dog’s size and whether they are going to grow anymore. You want to make sure you get a kennel that your dog will not outgrow very quickly. if you have large dog like a Bullmastiff or a German Shepherd a sturdy kennel with multiple panels is a must. If you want your dog to relieve in the kennel, they'll need sufficient room to be able to more than just turn around in it. They'll want to be able to move away from their business and not step in it due to being restricted. One COULD just buy more panels for some models to make the kennel larger for when you need it down the road. Your dog should be able to stand, turn, lay down, and fully stretch out in the kennel and ideally there should be enough room for them to play with toys in their kennel. Look for roomy kennels when you can also add in a bed, toys, food and water dish so your dogs have everything that they need while they are contained in their kennel. Is your pooch a heavy chewer and likely to get out of anything crate-like? As you're buying it for outdoors, how waterproof materials are used? Here are some common materials you will find for an outdoor dog kennel. Outdoor dog kennels are generally not moved around as much once they are set in place, so the weight isn’t as important. Still, you want to make sure that the kennel is heavy enough to keep your dog secured inside. That means it should be able to withstand your dog’s strength and any type of extreme weather and winds that you might experience where you live. If you do want to bring your dog kennel to different places when you travel, finding a lighter one might be something to think about. Lighter kennels are also good if you can’t set up a larger fixture or have a smaller dog that can’t move a lighter kennel. We did the detailed comparisons of the best selling outdoor dog kennels for you, so check them out above. 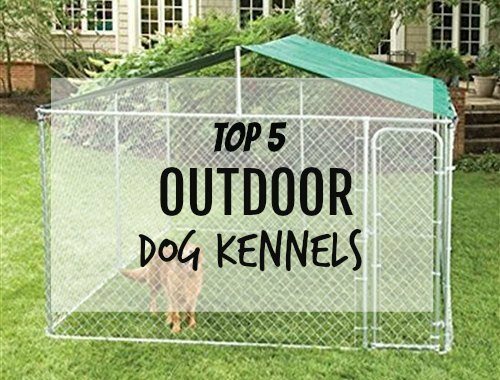 There are many different types of outdoor dog kennels out there with features to help keep dogs safe and comfortable when being contained outside, sometimes without their owner’s supervision. Some crates are heavier, good when they are kept in one place perfect for big dogs or escape artists. Others are lighter, quick to assemble and take down, and perfect for owners who need a larger travel solution. Generally, steel crates are one of the sturdiest options along with metal ones. Owners want to make sure that they have some sort of cover to help keep their dogs dry in rain or snow and out of direct sunlight during the warmer months. Having a kennel that is off the ground also keeps it safer from the elements and makes it easier for dog owners to keep it clean. Dogs love getting to spend more time outside in a kennel that lets them play and run around, but owners need to make sure that their dogs are given water when kept in for long periods of time. You should never substitute a kennel for regular walks outside. Are you using an outdoor dog kennel? Do you have any favorites?